PulseAudio is a networked sound server that allows software mixing of audio. See the PulseAudio website for more details. Software mixing of multiple audio streams, bypassing any restrictions the hardware has. Network transparency, allowing an application to play back or record audio on a different machine than the one it is running on. Sound API abstraction, alleviating the need for multiple backends in applications to handle the wide diversity of sound systems out there. Generic hardware abstraction, giving the possibility of doing things like individual volumes per application. PulseAudio comes with many plugin modules. All audio from/to clients and audio interfaces goes through modules. PulseAudio clients can send audio to "sinks" and receive audio from "sources". A client can be GStreamer, xinelib, MPlayer or any other audio application. Only the device drivers/audio interfaces can be either sources or sinks (they are often hardware in- and out-puts). Starting with openSUSE 11.0 pulseaudio is used for GNOME installations. By default the daemon is automatically started if an application tries to use pulseaudio. This makes it a source of problems given the wide range of sound systems/applications being used in multimedia applications. That's why if you are having issues with PulseAudio, before reporting them to our Bugzilla, make sure you read this article about the perfect PulseAudio setup. It contains information about making all available sound systems use PulseAudio for the actual sound playing. If on the other hand you wish to disable pulseaudio altogether and fall-back to ALSA for all GNOME based applications, please read section Disabling pulseaudio completely (ALSA fall-back) below. If on the other hand you wish to disable pulseaudio altogether and fall-back to ALSA for all GNOME based applications, please read section Disabling pulseaudio completely (ALSA fall-back) below. There have been cases where the volume is muted by default, and this isn't exposed in the KDE mixer. To fix this, run padevchooser (you may have to install it), click the tray icon, and choose "Volume Control". Check that everything is not muted, including after you start playing sound through an application (the application should show up in the "Playback" tab). If the sound still isn't working, or the pulseaudio tools aren't working, try adding your user to the "pulse" and "pulse-access" groups (Yast > User and Group Management > [select user] > Edit > Details > Additional Groups). You'll have to log off and back in for this to take effect. There were issues getting 5.1 sound working out of the box, see bug 381686 for more information. 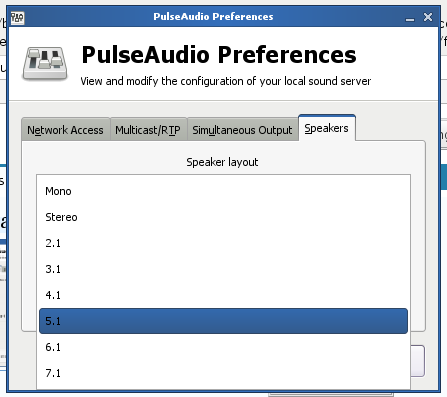 Many people have a surround card, but have speakers for just two channels, so PulseAudio can't really default to a surround setup. To enable all the channels, edit /etc/pulse/daemon.conf: uncomment the default-sample-channels line (i.e. remove the semicolon from the beginning of the line) and set the value to 6 if you have a 5.1 setup, or 8 if you have 7.1 setup etc. Or even easier, you can run paprefs and set the speaker setup via the paprefs GUI. Edit /etc/pulse/daemon.conf: uncomment the default-fragments and default-fragment-size-msec, and change values from the default 4 and 25 to 16 and 21. Please report back in bug 381686if this works or not for you. Remove all pulseaudio* packages and install esound. Remove all pulseaudio packages except libpulse-mainloop-glib0 and libpulse0, as these are required by all GNOME based applications (since they are compiled with pulseaudio by default). Note that if under $HOME/.pulse you have properly setup configuration files (e.g. from when pulseaudio was enabled), the last step above for hiding the pulseaudio libraries may not be required. However, if you accidentally (or intentionally) delete $HOME/.pulse, GNOME based applications will loose audio once again. Regardless of the contents of /etc/asound.conf, moving the libraries out of the way is the only guaranteed method to force fall-back to ALSA. Use an ALSA compatible mixer (e.g. kmix under KDE or alsamixer in a terminal) and make sure all channels of interest are not muted. Note that this is a work-around, not a definite solution: if either the libpulse-mainloop-glib0 and/or the libpulse0 package is updated, you will need to reissue the above commands to move the pulseaudio libraries out of the way once again, by using the above commands. Move ~/.config/pulse to ~/.config/pulseold and try to start pulse again. It should come up on the second try. Pulseaudio supports LADSPA plugins, through this a compressor plugin can be used to achieve what is often called "night mode", the goal being to reduce the volume of action sequences (explosions, etc.) in films and other media without diminishing the volume of the quieter dialogue. Steve Harris' LADSPA plugins are available in openSUSE and include a number of compressors (we'll use the "SC1" compressor in this example), the package is called ladspa-swh-plugins, install that and also an advanced Pulseaudio volume and outputs control panel, such as pavucontrol. Now open pavucontrol and the SC1 LADSPA plugin should be a selectable output device. The settings used in the earlier example give good results in many cases, but one setting you may sometimes want to adjust is the threshold level. It's set to -25 in the example but if the compressor seems to be engaging often for dialogue (which is not what we want - we want it engaging for loud action scenes and such) try -20, or if a track has particularly low volume in general, so the compressor is not engaging for dialogue but action is still too loud, changing the threshold to -30 can improve the results. See the documentation for more details. You can see that compared to the earlier example, this example includes master= parameters that are set to the device identifiers as shown in the pacmd output that was retrieved earlier (so don't just arbitrarily copy-paste the above example, you'll have to modify it to use your device identifiers). Then restart Pulseaudio as described earlier and you should have SC1 LADSPA plugin output devices for each of your sound devices. This page was last modified on 29 November 2018, at 19:42. This page has been accessed 67,271 times.